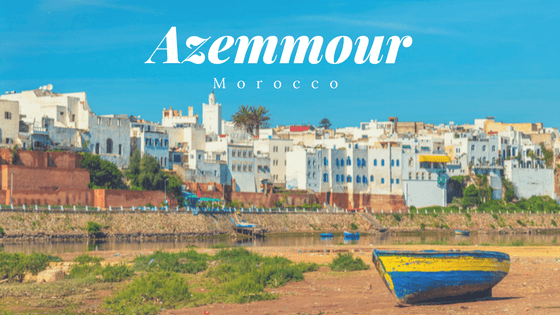 Not far from Casablanca and accessible by train, Azemmour is a great weekend trip. It is small enough to explore by foot with both medina life and nature to enjoy. 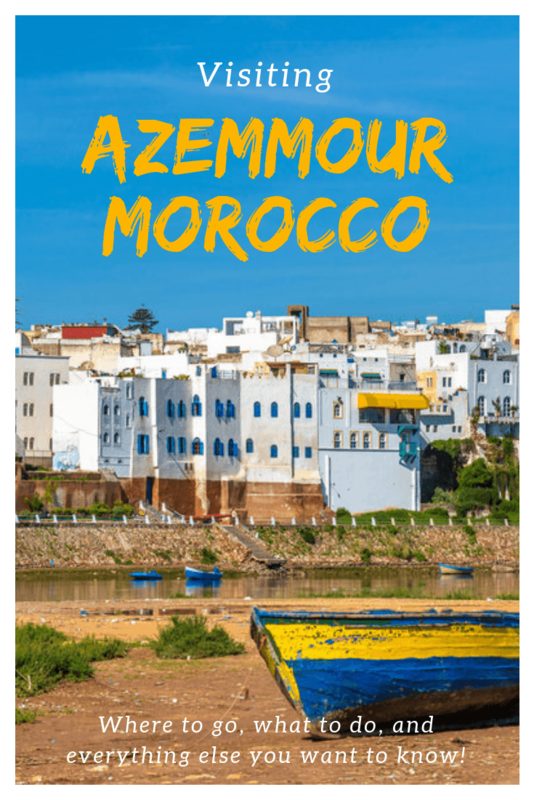 Azemmour is situated on the river Oued Er-rbia and is also near the ocean so there are plenty of nice views and places for hiking and picnics. The city has a rich history of Jewish life as well as its time under Portuguese rule from 1513-1541. During the 15th century, the Portuguese were securing coastal sites and were able to offer protection to the already settled town of Azemmour. Later when the governor, Moulay Zayam, refused to continue paying tribute, a Portuguese army was sent and the ‘Battle of Azemmour’ resulted in the conquest of Azemmour. The famous explorer Magellan was a soldier in this battle. Portugal eventually abandoned Azemmour due to economic reasons. During the time of Portuguese rule, Esteban the Moor or Mustafa Zemmouri was enslaved, sold to a Spanish nobleman and eventually ended up as a translator and explorer on an expedition to North America. A bust of him is part of a historical sculpture series in El Paso, Texas. As you walk around Azemmour, you are surrounded by history reflected in the walls, kasbah, and medieval architecture. Enter the medina and enjoy a walk through the history of this quiet city. You’ll find the remnants of the Portuguese walls and ramparts to explore with great views. In the medina, you’ll find the old Kasbah (castle) built by the Portuguese (16th century) with its 6 towers and original cannons. Also visible are the remains of the mosque (which predate the castle) as well as the castle’s prison and 2 towers. The most significant structure is the Dar El Baroud tower which is all that remains of the gunpowder storage. The Jewish section of the medina provides a look back into their history in Morocco. The Jews of Azemmour were mainly made up of exiles from Portugal who found refuge there in 1496 and included fishermen, craftsmen as well as some wealthy merchants. The community flourished under the later Portuguese occupation in 1513 and those Jews who had been forced to convert to Christianity (marranos) were allowed to go to the interior (Fes) where they could return to their Jewish faith. Later when the town was taken back by the Moors, the Jews were sent to Asilah and were even compensated for their losses by John III of Portugal. Although a local community was re-established in 1780, most of the wealthier merchants ended up in Mazagan (El Jadida). Within the Jewish Mellah, you will find the tomb and shrine of the Jewish saint, Rabbi Abraham M0ul Niss (Mulannes) and a synagogue. This is not a verified or documented story, but the story told about the saint has him arriving in 1870 from Israel and then later in the 1930s, during the French Protectorate, the French Governor had a sick daughter who was brought to the Rabbi. The young girl was healed from her sickness and people began to repopulate and revitalize the Jewish quarter of the medina, thus the Rabbi’s name became ‘Moul Niss’ or translated ‘Leader of people.’ A festival or moussem is held each August at the tomb (according to online reports but not verified). There is also the Jewish cemetery to visit which testifies to this community now gone. The 2 burial sites of these 2 people still bring many people to their sites especially on their special day of the year when people make a type of pilgrimage. Their stories are intertwined with various versions told but it seems that Moulay Bouchaib Erradad was a sufi disciple who traveled to learn more and bring back his teaching to Morocco. One of his trips went as far as Baghdad where he may have met Lalla Aicha Bahria or perhaps she heard of him. Either way, she decided to come by sea and find him in Morocco but sadly ended up drowning in the river. Her site is known for helping women who desire to get pregnant. The marabout of Moulay Bouchaib Erradad is in town not far from the medina and hers is outside of Azemmour near the river. For several years Azemmour held an annual street art festival where artists were selected to paint murals around the medina. Even though it hasn’t been held in recent years, a walk around the medina will allow you to enjoy lots of artwork still remaining. If you are staying at the L’Oum Errebia, you will have an actual art gallery surrounding you. The owner is an art lover and collector and has filled the riad with a wonderful variety of artwork. You can often find boats on the river and a small price can be negotiated for a little ride down the river. 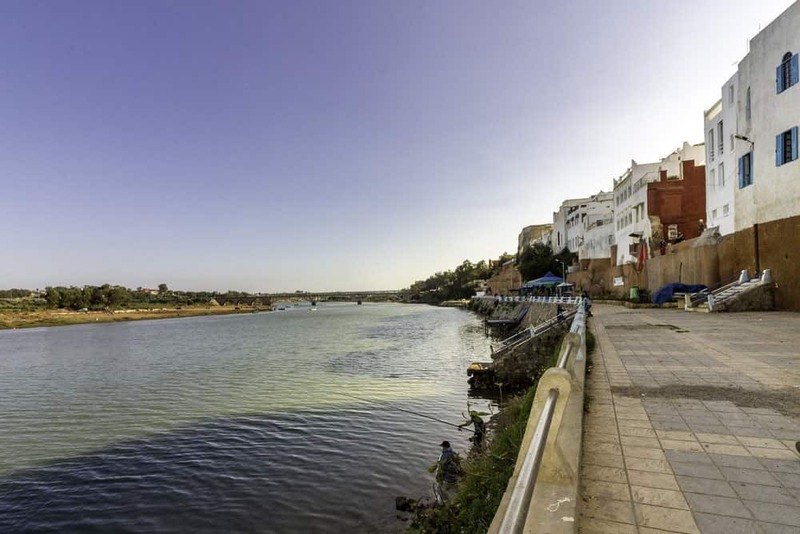 The Oum Er R’bia river is the 2nd largest in Morocco and is a relaxing way to see the setting of this city with so much history. About 5 miles north of Azemmour near the coast, you’ll find the historic Sidi Boubeker lighthouse which makes a nice outing. Spend some time at the Haouzia beach which has the usual additions during the summer months like umbrellas to rent ad food to buy. The rest of the year it is less crowded and a beautiful place to relax. The waters can be strong so be aware and careful with swimming. If you want an interesting side trip as you leave, drive southeast from Azemmour to visit the Kasbah Boulaouane, a beautiful Kasbah out alone on a hill. The Kasbah was built in 1710 by Moulay Ismael thought to be part of his efforts to bring peace to the area and maintain control. 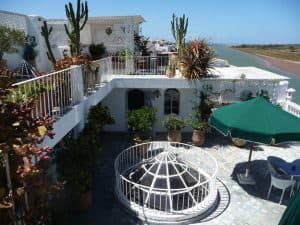 As you approach the Kasbah, you climb gently to the top of a hill with beautiful views out around the Oued Er R’bia river. If you are headed north to get home, continue on in a northeast direction toward Settat. 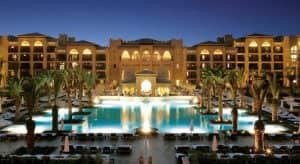 One of the premier resorts in Morocco is located only a few miles south of Azemmour on the beach. Take a drive over and walk around or eat at one of the restaurants. A totally different experience from staying in the medina of Azemmour. 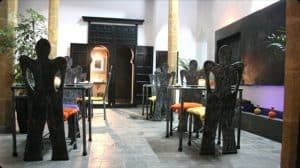 Situated in the medina and overlooking the river, this hotel/art gallery is comfortable without being pretentious. Healthy fresh food is served (reserve dinner) and a baby grand piano is available if you should feel like playing. Two riads were combined to create this large, beautiful riad. The price also can’t be beat with average room rates around $50 a night. Breakfast is included and the beach is a short walk away. With 4 suites and 5 rooms this hotel can accommodate up to 20 guests with half and full board options available if you simply want a spot to escape and relax. An on-site spa, stables and cooking classes are all available and day trips can be organized as well. 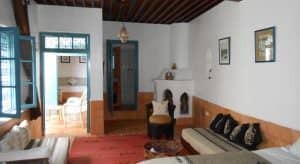 Five simple, but elegant rooms make up this riad in Azemmour. With close proximity to the ocean you can relax or windsurf on the beach or in the water. Rooms start at appr. 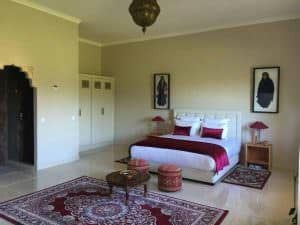 $50 a night and the entire riad can be rented for under $300 a night – making it a great choice for a group of friends or families traveling together.